Cryptsy is an Internet startup operated by Project Investors, Inc. focusing on the exchange of Crypto-Currency commonly known as “BitCoin” and it's derivatives. We currently service more than 90 different types of crypto-currency. 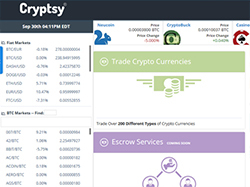 The Cryptsy.com exchange opened on May 20th, 2013 and since then has seen rapid growth in both customer base and trade volume. We currently have over 230,000 registered users with a volume of over 300k trades per day. Cryptsy will expand its service offerings for merchants who want to easily accept BitCoin and other crypto-currency payments as an alternative payment method for their ecommerce sales.